Snake Tray is committed to designing and manufacturing products that have many green benefits. Our products are made of recycled materials, minimize material waste, use less non-renewable resources, nest together to lower the cost of material handling and shipping and have energy efficient features. 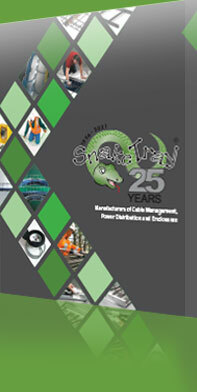 As a company, Snake Tray is committed to manufacturing our products in a way that minimizes impact on the environment. We are proud to say we are the first in our industry to manufacture utilizing solar power from our own roof top solar array. We have streamlined our manufacturing methods and have adopted greener practices including reducing waste, saving energy, and utilizing resources wisely. We are active members of the US Green Building Council and stand ready to help building owners, architects and design engineers reach their sustainable building goals. Our products are made of 100% recycled steel. Our products require no fabrication so no waste material is created. Our systems also use less hardware and accessories to install. Our products nest together for compact shipping. We use less packaging materials and require less material handling, which also reduces energy used in the transportation of goods. Our products use less transportation to reach the building site. Our products can be reused and are made of 100% reclaimable products. Snake Bus consumes approximately 30% less of the earth’s copper resource than all other methods. Snake Bus is made of 75% recycled products. Snake Bus can be moved and reused. Snake Bus is made of 99% reclaimable products. Snake Bus’ unique bus bar technology experiences less voltage drops versus traditional copper wire thus reducing energy consumption. System requires no use of pipe and wire, no vertical cabling and eliminates abandoned cable, minimizing landfill additions.